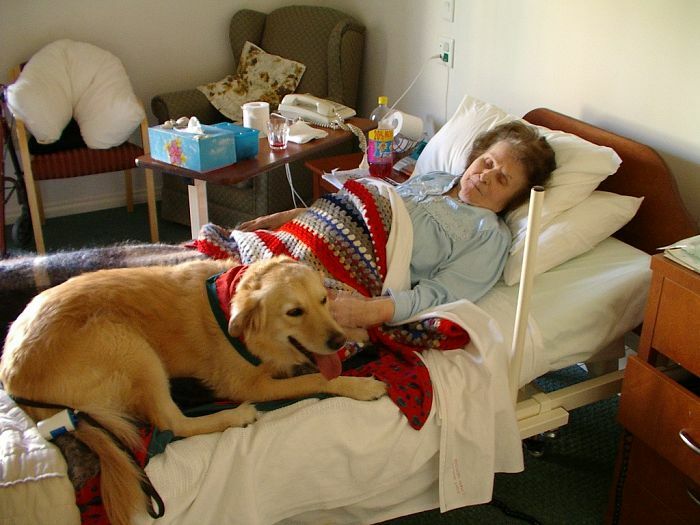 The demand for therapy dogs is growing due to their many benefits for patients. 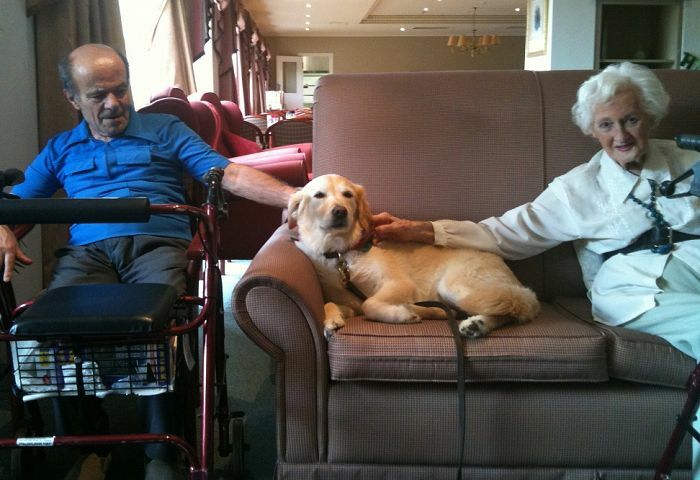 Deputy editor Sandi Keane talks about her golden retriever Milka’s time as a Delta Therapy Dog — helping people in palliative care and going through rehabilitation. The slumbering canine uncoils like a spring into 30 kilos of quivering air dancer, galvanized for action. The dog little suspects her unflagging faith in canine-human empathy was about to be challenged. A 20 minute drive away, through Melbourne’s inner leafy suburbs, we arrive at a popular park. To one side, a muddle of dogs and people form a rough circle on the grass, waiting. Toby, a handsome Airedale, stands in the centre with a look of goofy dog expectancy, buoyed by that universal Pavlovian truth — parks equal fun. But there is little fun on today’s program. They come at him waving umbrellas and a clutter of other pointy objects, abusive and scary. Jerking his owner off her feet, he bolts to the sidelines and safety. Sheba, the German Shepherd-cross, next in line, follows suit. Now the golden retriever’s turn. They swoop down on her, wielding weapons of the infirm — A-frames, walking sticks, shouting. “Oh goody, a game,” she responds, as pure joy sends her tail into overdrive. They pull her ears(“oh, bliss”) poke and prod parts both public and private as her tail thumps out her approval. Unlike Toby, she is oblivious to the betrayal. “Ha! Perfect! She’s bomb proof,” declares the leader of the human pack. Milka, my newly minted Delta Therapy Dog, has just passed with honours. Lily the Delta Therapy Dog. The demand for therapy dogs is growing following positive reports from front line practitioners who have witnessed firsthand the physical, emotional, social and cognitive benefits. Although modern medicine has triumphed over diseases of yesterday like polio, our modern lifestyle with all its stresses presents unprecedented health challenges. Innovative approaches beyond prescriptive drugs or human counselling are called for to assist the chronically ill, psychologically disturbed and the aged. This is where the Delta Society and others such as Lort Smith Animal Hospital and Caring Canine Companions come in. What their four-legged healthcare practitioners deliver in the way of medicine as they happily trot from room to room is two parts unconditional love, two parts loyalty and a side order of unflappable optimism. As a valuable adjunct to traditional treatment, it is working. The call from Delta comes a week later. Milka is to take her unshakable faith in man to an area of medicine where faith in cures had surrendered its primacy to dispensing love and comfort. She is to be assigned to the palliative care unit of the Royal Melbourne Hospital. Two weeks later, with the all-clear from her pathology results, we are at the lift in the hospital foyer, Milka in her red bandana and me in my matching tee shirt. The lift opens and disaster strikes. The trial by torture in the park, the pain and indignity of veterinary implements thrust up her privates and down her throat were a picnic compared to entering the LIFT! Thankfully, one of the hospital volunteers finds a biscuit, coaxes her in and we take off to our destination on the 6th floor. The cry goes out as nurses congregate around their newest member of staff. I’d been warned that the palliative care unit was a bleak place and overdue for renovation before I attended my first briefing with the social worker, minus the dog. But the lack of flowers, balloons, get well cards, blaring TVs and boisterous friends piling onto beds and spilling onto chairs seen elsewhere en route strikes a chord. The social worker is counting on the unflagging optimism of a happy, loving dog to break through this cheerless atmosphere. But the qualities of selflessness and devotion aren’t solely the preserve of our family pets. Some of the patients who were to become our friends that year spent their last breath and energy channeling the pets they were forced to leave behind. David (not his real name), fortyish, newly arrived, agonises for weeks about the future of his four cats as he sends out distress calls, searching for homes, then issuing care instructions — Jasper will want to crawl under the covers and curl up on your feet; Charmer is terrified of thunder. We jokingly talk of cracking open a bottle of bubbly when the last of his little brood finds a new Dad. There are photos of the cats all over the wall. Many of the new surrogate Dads, all close friends, visit regularly and we laugh about the latest antics of Lucy or Paws. I am touched one day when David opens a drawer and pulls out a variety of toys he had organized a nurse to buy for Milka. Could we return after our rounds so he could play with Milka and the new toys? David with Milka’s new toys. David’s resolute good humour and generosity of spirit betrayed the inevitable. Next week, his bed is empty and all trace of him gone. The week before, after giving Milka the toys, we had argued. With no family, he wanted to leave some money in his will to Milka just as he had done with the cats. I was troubled by the ethics of this and solicited help from the social worker. When I returned, as was our arrangement at the end of my rounds, the social worker had just visited and he was upset. It was the last time I saw him. No chance for a joke about the cats to smooth things over. I wondered whether I was cut out for this work. The use of Animal Assisted Therapy (AAT) is not new but there has been relatively little research owing to the problem of funding. This kind of therapy dates back to the 1600s, including John Locke’s experiment of using small animals to cultivate empathy and responsibility in children. One of the earliest recorded accounts of AAT was Boris Levinson’s startling discovery that his dog, “Jingles” could coax a disturbed child to speak. His started writing about the benefits his dog brought to his counselling sessions in the 1960s and continued until the 1980s. But testing the results in a coherent and convincing way requires funds. For Professor Pauline Bennett at Latrobe University’s School of Psychological Science, this is a challenge. A strong advocate of AAT, she set up the Australian Anthrozoology Research Foundation for the prime purpose of attracting funding. Bennett has dozens of would-be PhD students in this important area of health who all need funding. But how likely is it that the normal source of funding – the pharmaceutical companies – will fund a study that could see the family pet replace the need for, say, blood pressure medication? It is early days for the fledgling foundation and Bennett is just starting to explore other funding avenues. “Health insurance is an obvious one,” she said. The little research so far is encouraging. 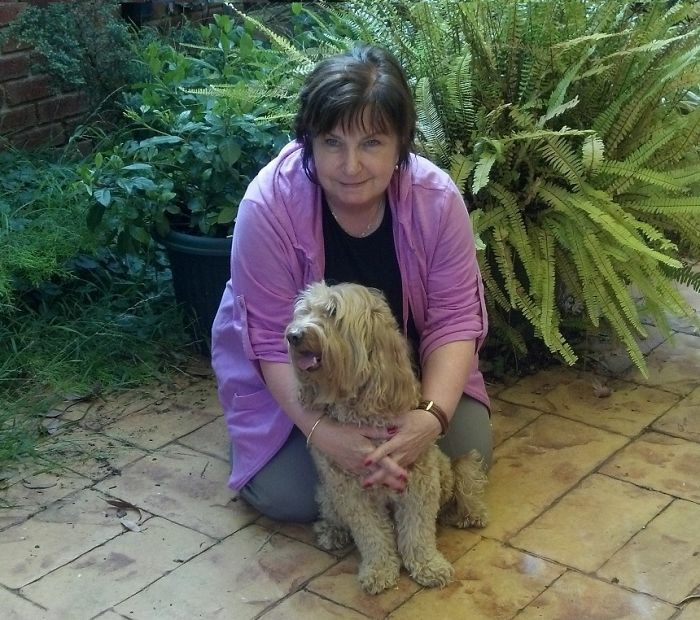 Recent research for a PhD thesis by Anne-Marie Wordley at the University of Adelaide’s School of Psychology shows promising results for dementia patients using Animal-Assisted Intervention. Residents’ disruptive behaviour, memory problems and depressive behaviour were found to significantly decrease during the intervention. 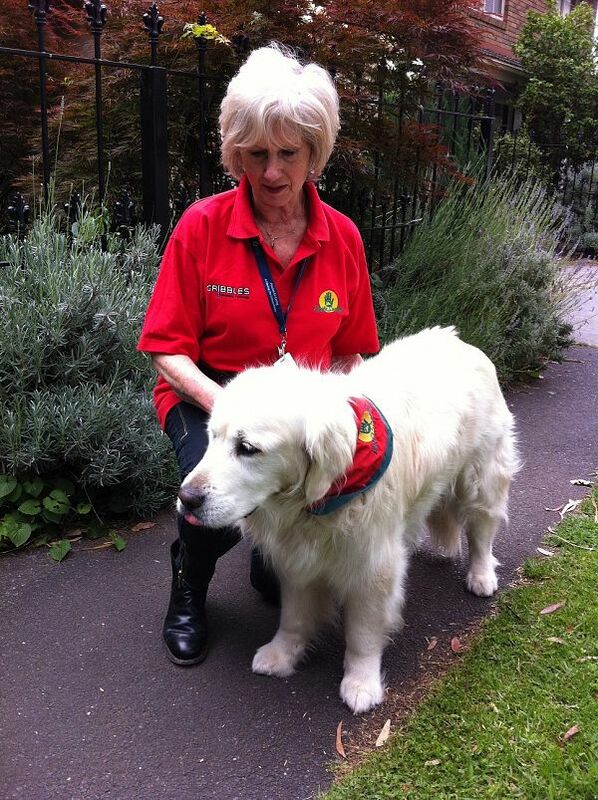 Lily is a veteran of the Delta Society therapy programme. Veteran Delta volunteer, Daniela Thuess, talked about her experience with dementia patients. 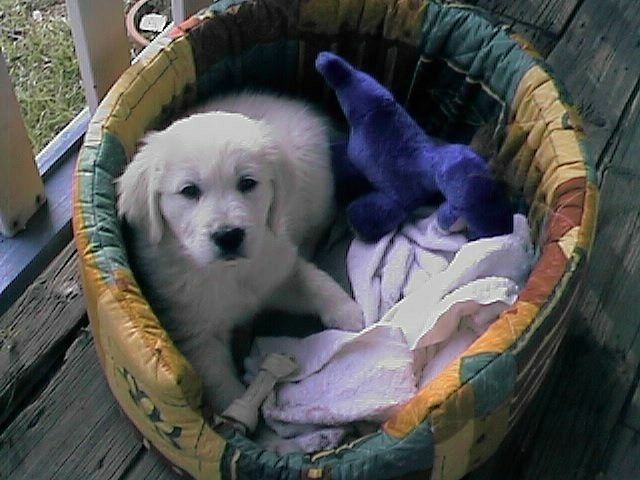 Daniela has been in the Delta Society program for five years with her golden retriever, Lily, now ten years old. 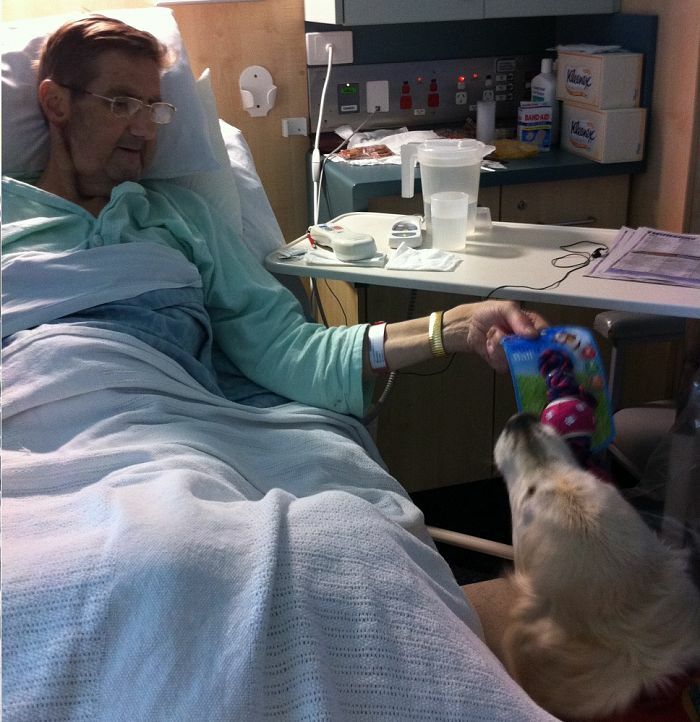 Their first visit to an elderly dementia patient rekindled his storehouse of memories about his own dog. As he chatted on remembering this incident and that, his daughter started to cry. “He hasn’t remembered anything about his life for a very long time and now he can remember something so clearly,” the daughter said. There are a number of therapy dog organisations in Australia. Delta Society is the largest with 1,000 specially trained and selected dogs with their volunteer owners. There are also smaller state-run organisations like the South Australian Golden Retriever Club’s Community Visitors Scheme. 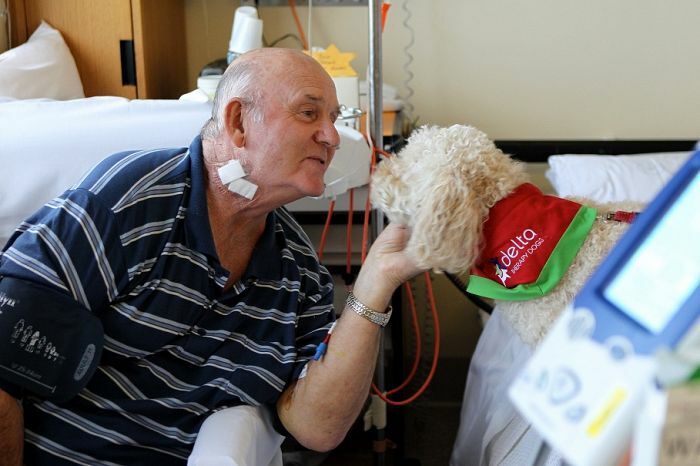 This involves over 100 different breeds of dogs visiting patients in aged care facilities. In Wodonga, in Victoria’s north, Companion Animal Services has been operating for twenty years with a range of pets from dogs to ducks. They visit aged care facilities as well as special needs schools. In Melbourne, Lort Smith Animal Hospital’s Pet Therapy program also started twenty years ago. It now has over 120 dogs and volunteers, many of them rescued from death row and given a second life as specially trained counsellors to the sick and frail. Lort Smith volunteer, Betty Reissinger and her nine-year-old spoodle, Teddy, kitted out in their matching blue tee shirt and canine coat, have been visiting cancer patients and the elderly for two years. Betty’s interest in the benefits of human-dog interaction was sparked by the difference she saw in her own mother. Lort Smith volunteer, Betty Reissinger and her spoodle, Teddy. “My mother has advanced Alzheimer’s, but I was struck by the change in her whenever I visited with Teddy. She might forget my name but never forgets his,” she said. There are many stories to tell from my own year about the magic worked by a loving dog. One of the most interesting stories was our friend, Ron (not his real name) — a special case, the social worker told me. He had not spoken a word for weeks. For the first few visits, Milka licked his hand without response then finally he spoke, stretching out his hand to stroke her. So it continued each week until I eventually got a “hello” as well. Duly noted by the pleased social worker, we discussed whether Milka’s habit of licking those who were seriously ill was her way of showing empathy, as it was not her habit as we were to see later with other patients. As Milka became a regular sight around the hospital, nurses would hurry to catch us along the long labyrinth of corridors with requests to visit their ward. Having lost an eye to a wombat on our Howqua River property several years before, it was decided she would be a good fit for the rehabilitation unit if we could manage the extra duties. Here was a dog to whom they could relate! She couldn’t heal their wounds but she could apply those canine-healing powers to mitigate the pain. The interesting thing was that, once in “rehab”, her bowed head and urge to lick was replaced by her usual jaunty, upbeat self. She appeared to dispense her medicine as she saw fit. 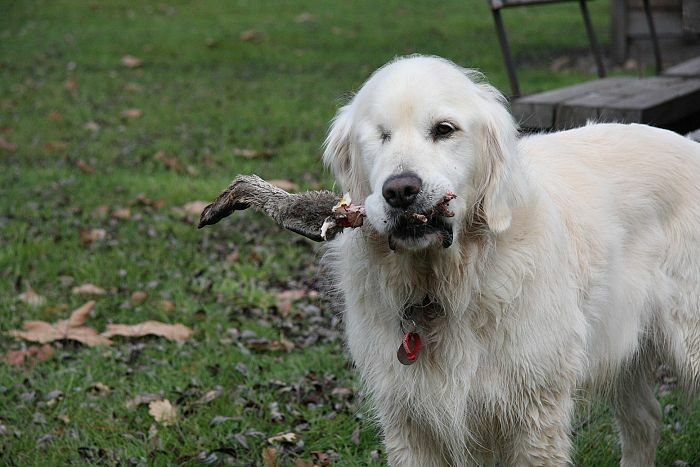 Milka had lost an eye to a wombat years before. Milka’s initiation back in the park served to condition her well for this ward. Plaster casts and crutches could inflict pain and were easily missed by a dog with one eye! Few in this ward wanted to miss the chance to indulge in play or feed the dog prohibited leftovers they had squirrelled away from lunch. Some of the older patients would just sit in their chair hugging her. “Could you wake me if I’m asleep?” was a common note left on the pillow. Wheel chair bound young Alan (not his real name), whose brain tumour had already robbed him of most of his hearing and his sight, gave instructions via the nurses to “please wait until I return” or, rather hopefully, given food areas were out of bounds to dogs, “meet me in the café”. He would cuddle her head and stroke her long, silky ears between his legs. He once asked to feel my face and hands as well, to “get to know me”. Milka always strained on the leash to get to Alan’s room, her tail brushing legs and wheelchairs in her wake as it wagged its broad grin. She didn’t even mind when he accidentally ran over it one day in his wheelchair. “No worries,” her tail tapped out furiously like an Ashanti tom tom, “I’m bomb-proof”. Follow Sandi Keane on Twitter @Jarrapin. Donate to the Delta Therapy Dog programmehere. Published on Independent Australia 26 December 2013 here.